The Dandelion is well known for its flower, its roundel of seeds and its trademark smell. Far from discarding it as an invasive weed, our gardeners carefully nurture their annual crop because they know, as Alfred Vogel did, the benefits of using the whole plant including the roots of this undervalued plant to help maintain the body’s health. The Dandelion plant is often seen as a weed. However, it has distinct medicinal properties and its action on the liver is particularly prized by herbalists. Dandelion is an excellent cleansing agent, being one of the most effective detoxifying herbs. It possesses a wide range of active constituents and is also rich in minerals and nutrients. The root of the plant stimulates liver function. This has a primary use in improving digestion as a result of an increase in digestive juices. 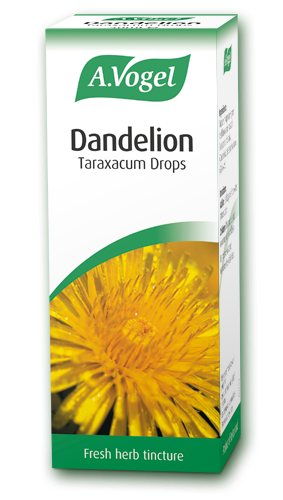 In addition, Dandelion leaves have diuretic and mild laxative properties. Those with liver complaints, gallstones or an obstructed bile duct should first consult a Doctor. Do not take alongside diuretics. This is not intended to replace medical advice. You should consult a Doctor or Pharmacist if you have any condition that is of concern. It is also recommended that you consult a Healthcare Professional before taking herbal remedies if you are pregnant or breastfeeding or before giving herbal medicine to a child under two years old. Do not exceed stated doses. Do not use alongside medication with the same action, e.g. a tranquillising herb alongside tranquillising medication. Do not take more than three herbal remedies concurrently. Tinctures of organically grown fresh leaves and roots of Taraxacum officinalis (Dandelion), extracted in alcohol (50% v/v). Adults: 15 drops in a little water 3 times daily.